Another take on the inauguration of George Washington in New York City in 1789. Sarah Franklin Robinson described the festivities to her cousin, Catharine Wistar. For Quakers, the “4th Month” is April, and the “fourth day” is Wednesday, Sunday being the first. New York 30th of the 4th Month Great rejoicing in New York on the arrival of general Washington, an elegant Barge decorated with an awning of Sattin 12 Oarsmen dressed in white frocks and blue ribbons—went Down to E[lizabeth]. Town last fourth day to bring him up—a Stage was erected at the Coffee house wharf covered with a carpet for him to step on—where a company of light-horse or of Artillery & most of the Inhabitants were waiting to recieve him they paraded through Queen Street in great form—while the music of the Drums and the ringing of bells—were enough to stun one with the noise. 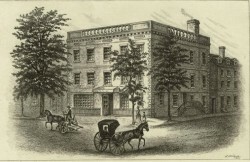 After his excellencys arrival a general Illumination took place except among friends [Quakers] and those styled Anti Federalists—the latters windows sufferd some thou may Imagine—as soon as the General has sworn in—a grand exhibition of firworks is to be displayed—which it is expected will be to morrow—their is scarcly any thing talked of now but General Washington & the Palace—and of little else have I told thee yet tho have spun my miserable scrawl already to great length—but thou requested to Know all that was going forward. This excerpt of Sarah’s letter can be found on pages 296-97 of In the Words of Women. The illustration is at the New York Public Library.